The clean energy business is heating up in this week’s solar spotlight state, Utah. Now ranked the eighth state in terms of installed solar electric capacity, the number of solar companies in Utah is growing as the regions benefits from continued solar energy demand and growth. Both residential and commercial investments are being made with help from large companies like Ikea, which installed Utah’s largest commercial solar system. 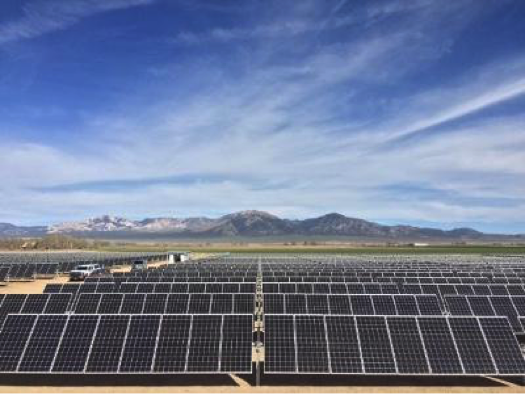 And according to the Solar Energy Industries Association (SEIA) Over the next 5 years, Utah is expected to install 2,230 MW of solar electric capacity, ranking the state eighth over that time span. This amount is more than 9 times the amount of solar installed over the last 5 years. Let’s take a look at some of the reasons it’s a great year to go solar in Utah. Residential solar panels Utah has been growing rapidly, part in thanks to the state’s net metering policy. Net metering refers to an agreement set up between individual solar power producers and the local utility company. In some states, utility companies will allow users to feed the electricity they produce back to the grid, and credits them for it. Customers can also draw electricity from the grid when needed, and will then only pay for their “net” energy usage. Net metering differs in each state, and is a great way for solar panels owners to be able to reduce their electric bills even further. Fortunately for Utah residents, homeowners with solar panels can take advantage of this kind of policy. Utility providers in the state offer incentives between $0.60 and $1.25 per watt generated. Another reasons that it’s a great time to have residential solar panels in Utah are the state’s tax incentives program. This is another policy that is different in each state, so not every area receives as many benefits. The individual income tax credit for residential systems is 25 percent of the reasonable installed system costs up to a maximum credit of $2,000 per residential unit. A tax credit is a dollar-for-dollar reduction in the income taxes that a person would otherwise have to pay the government. Combine the 25 percent state credit with the federal solar investment tax credit, a 30 percent tax credit for solar systems on residential and commercial properties, and you’ve got yourself quite the solar savings. Alternative sources of energy are particularly appealing to Utah residents because of the state’s higher than average utility power rates. According to the State of Utah Public Service Commission, one Utah power company has averaged 4.44 percent increases since 2000. In the last seven years alone utility electricity rates have gone up 50 percent. Investing in a solar panel system guarantees electricity at a fixed cost and avoid fluctuating utility prices. Do solar panels save money? Utah residents are saying yes! This more cost efficient and clean energy resource can help tremendously to offset your monthly and annual energy costs. You can calculate exactly how much your household can save with solar panels in Utah and across the country with our solar savings calculator. Combine all of these awesome state-based incentives with the fact that the up-front cost of solar panel installations are at an all time low, and its clear to see why solar power in Utah is seeing a surge in growth. The average installed price of photovoltaic (PV) devices has fallen by more than 50 percent since 2009. According to research from The Berkeley Lab, up-front costs have fallen from around $6.3/W in 2009 to $3.1/W for projects completed in 2014. If you’d like to get free quotes from solar power companies in Utah, or anywhere in the U.S., simply fill out the short form below.